This book provides digital leaders who are accountable for the rapid development of high-quality software applications a concise guide to designing, implementing, measuring, and improving DevOps programs that are tailored to their organizations. 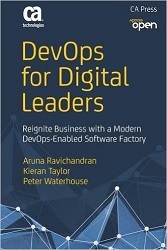 In this book, deep collective experience on both sides of the dev-ops divide informs the global thought leadership and penetrating insights of the authors, all three of whom are cross-portfolio DevOps leaders at CA Technologies. They analyze the organizational benefits, costs, freedoms, and constraints of DevOps. They chart the coordinated strategy of organizational change, metrics, lean thinking, and investment that an enterprise must undertake to realize the full potential of DevOps and reach the sweet spot where accelerating code deployments drive increasing customer satisfaction, revenue, and profitability. Digital leaders are charged to bridge the dev-ops disconnect if their organizations are to survive and flourish in a business world increasingly differentiated by the degree to which dynamic application software development harmonizes with operational resilience and reliability. This short book applies the DevOps perspective to the competitive challenge, faced by every high-performance IT organization today, of integrating and automating open source, cloud, and enterprise tools, processes, and techniques across the software development life cycle from requirements to release. Aruna Ravichandran is Vice President of DevOps Product Marketing and Solutions Marketing at CA Technologies. Kieran Taylor is Senior Director of Product and Solutions Marketing at CA Technologies, responsible for thought leadership and sales enablement for APM and CA solutions that help enterprises implement DevOps methodologies. Peter Waterhouse is Senior Director of DevOps Solutions Marketing at CA Technologies.